Ever wished you could enter the world of Tron? Well, thanks to one developer, you're one step closer than you were this time last year. 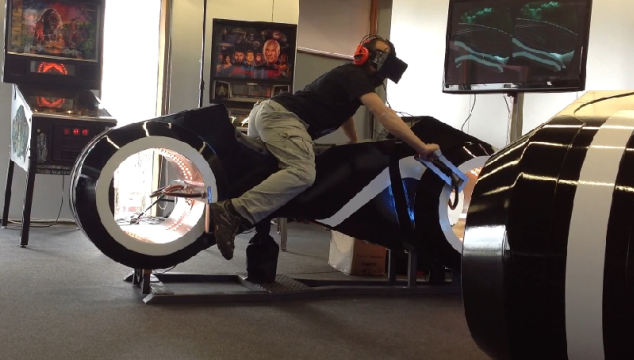 The RiftCycle project combines an Oculus Rift headset with a stunning full-scale replica of a lightcycle from Tron: Legacy. The project was imagined and brought to life by independent developer The Arcade Man. It's currently a one of a kind project and it isn't clear if they plan to mass produce it. The chassis of the bike itself is hand-built, while the simulator is a custom-complied version of the Light Cycle Simulator developed by Portugese start-up Overflow Interactive. “How many of us dreamed of being inside a game, this is a fantasy in the mind of all the nerdiest geeks,” The Arcade Man says on his website. His website documents its construction, including a huge range of photos of how he put the amazing replica together. Last month, Facebook bought Oculus Rift for around $2 billion. It hasn't announced what it plans to do with the headset. There's no word on whether or not it will become commercially available. T3 would like to think so - even if it meant putting the console controller down and strapping in down at the local arcade. Like the gaming days of old.